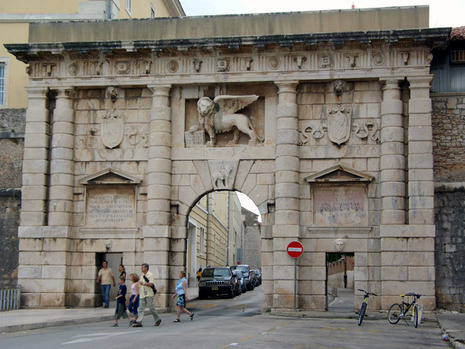 The Siege of Zara (Croatian - Zadar) (November 10-November 23, 1202) was the first major action of the Fourth Crusade. It was the first attack against a Catholic city by Catholic crusaders. Shortly after his election as pope in 1198, Pope Innocent III (1161-1216) published several papal encyclicals calling for the invasion and recapture of the Holy Land from the Muslims. His plan to accomplish this differed from the earlier ultimately unsuccessful Second and Third Crusades in several ways. Instead of the secular nobles who led the earlier crusades, this one would be, in theory, completely under Papal control. Innocent's plan also called for the invading armies to travel to Egypt by sea and seize the Nile Delta, which would then be used as a base from which to invade Palestine. His call was at first poorly received among the ruling families of Europe, but by 1200 an army of approximately 35,000 soldiers had been assembled under Boniface of Montferrat. 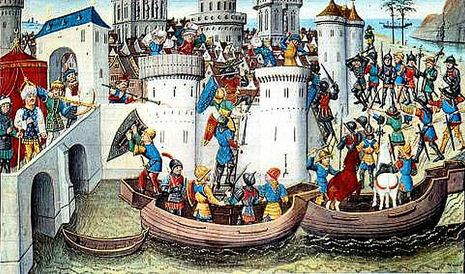 As there was no binding agreement among the crusaders that all should sail from Venice, many chose to sail from other ports, particularly Flanders, Marseilles, and Genoa. By 1201 the bulk of the crusader army was collected at Venice, though with far fewer troops than expected; 12,000 instead of 33,500. Venice had performed her part of the agreement: there lay war galleys, large transports, and horse transports - enough for three times the assembled army. The Venetians, under their aged and blind Doge, would not let the crusaders leave without paying the full amount agreed to, originally 85,000 silver marks. The crusaders could only pay some 51,000 silver marks, and that only by reducing themselves to extreme poverty. This was disastrous to the Venetians, who had halted their commerce for a great length of time to prepare this expedition. In addition to this 20-30,000 men (out of Venice's population of 60,000 people) were needed to man the entire fleet, placing further strain on the Venetian economy.